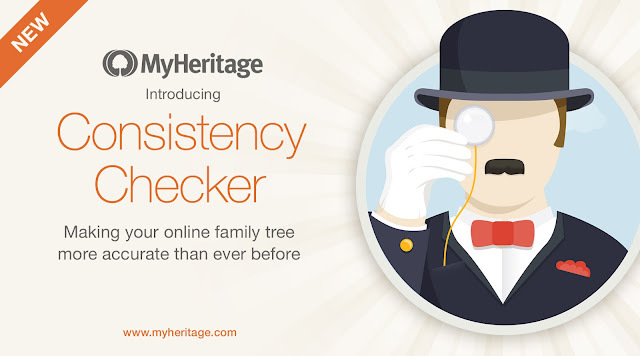 I'm delighted to announce the launch of the new Consistency Checker for online family trees at MyHeritage. This new tool scans your family tree and identifies potential mistakes and inconsistencies in your data so that you can quickly make the necessary changes in your tree, improving its overall quality and accuracy. At MyHeritage, we hold accuracy in high regard and the Consistency Checker is an important tool for family historians of any skill level. We hope it will improve the quality of collaborative genealogy as a whole. Nice feature. I'm running it now and see lots of work to be done. I'm thinking it would be more efficient to correct in RootsMagic and then upload a new gedcom and overwrite the existing one. However, I do not see a way to do this. Do you know how? No, I don't think you can update an existing MyHeritage file unless it is a sync with Family Tree Builder software. There is a good possibility that RootsMagic will be able to sync with a MyHeritage tree in the future, but it would probably have to be a new MyHeritage tree. I will wait for that, but continue fixing things in my RootsMagic tree until then.